Packer's classic summary covers nearly one hundred subjects, from a Reformed perspective. Brief, easy-to-understand chapters offer precise descriptions without sacrificing depth. The four main sections present God revealed as Creator, Redeemer, Lord of grace, and Lord of destiny. 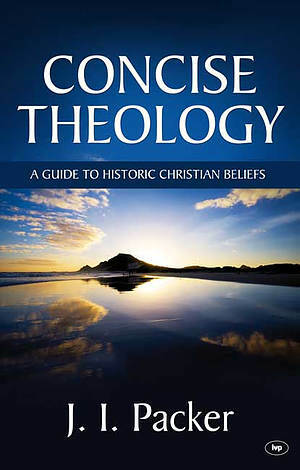 Concise Theology by J.I.Packer was published by IVP in March 2011 and is our 19301st best seller. The ISBN for Concise Theology is 9781844740512. This is a reprint of a book first published in 1993. This title sums up this book accurately. Dr. Packer, the well known Anglican theologian, summarises the core of the reformed Christian faith in 94 chapters each no more than 3 pages long. Loosely following the pattern of the Westminster Confession of Faith, the book covers a wide range including the nature of God, salvation, the church, the sacraments and last things. The book is easy to read, well written and full of scripture references. In nearly all matters he sides with the great reformers. So he emphasises salvation by grace, that God is sovereign in all things and that only the elect are saved. On those issues that have genuinely divided the protestant church (such as baptism and the last things) he is not dogmatic but instead presents the various sides fairly. The only weakness of this otherwise excellent book is that on a few vital topics he stops writing in a dogmatic style and instead sits on the fence. This applies to the chapters on the Lord’s Supper and spiritual gifts. Unsurprisingly, there are also a few things that he does not cover: for instance the danger of idolatry within the church. With the above caveats, this book is an accessible and helpful introduction to reformed theology. Got a question? No problem! Just click here to ask us about Concise Theology.